In my single player world, I landed my airship (pchan3's mod) to kill a few endermen, instead, I got killed by some mobs and lost a bunch of stuff. My spaceship is still out there (and probably my loot too). Is there a tool/mod with which I can process my world to find the location of the airship (and the dropped items) ? When you die, do not respawn. Instead quit to the main menu. Now open up a different world and hit F3. Now quit that different world, and go back to your main world. You'll still be dead, but now you'll be able to see your coordinates. Hit F2 to take a screenshot and you can then respawn and run to the coordinates that you've screenshotted. Note that the items you've dropped will not despawn until they're in a loaded chunk for five minutes (cumulatively). So, if you're a LONG way away, take some time to gear up properly; you don't need to hurry until you're close enough that those chunks are loaded again. This is a tip for the future. I've noticed, that you are OK with playing non-vanilla, so I recommend you to install the Rei's Minimap. It's an awesome map mod, with all kinds of useful utilities, including the automatic death point logging (don't forget to turn it on) - it will put a cross on the place, where you died the last time. However, these crosses accumulate pretty fast, so try to remember to delete them from the map, if you don't need them anymore. Otherwise, some day you will run a couple of thousands of blocks just for nothing. You can use the tool itemfinder. 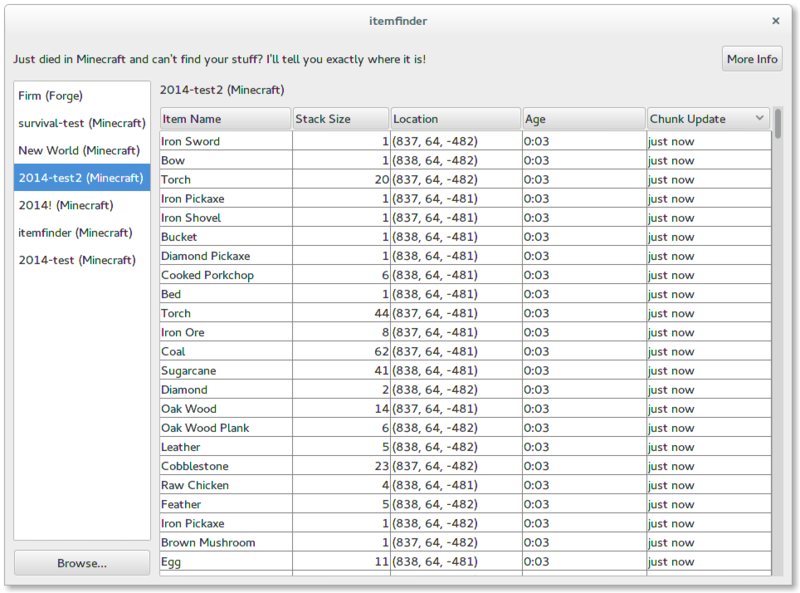 It lists all dropped items in the world, sorted by age and last chunk update. You should be able to look around your world using an map editing tool such as MCEdit to find your airship and items. Not the answer you're looking for? Browse other questions tagged minecraft mods or ask your own question. How can I recover from a world wipe due to the Technic Pack? Minecraft Multiplayer Server Coordinates Export?